I finally found a quick project that is not too complicated yet not too simple and one that is stylish enough so that when gifted will actually be worn. 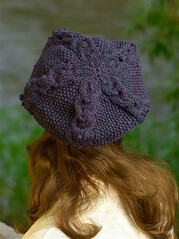 I cast on Miercoles Tam from Knitscene Winter 2011 with Brown Sheep Superwash Worsted in Golden Bronz. The project calls for only one skein of Brown Sheep Superwash Worsted and I cast on the larger size but the tam does not look big enough for an adult as it is on my needles. I often do over estimate head sizes and the pattern does say that the tam will relax after wet blocking but…guess who did not swatch. Yes that would be me. Also, I would like to know who has been hiding all my stitch markers. I keep buying a new set almost every month and in 3-4 weeks they are gone! What is a girl to do? Here is the tam looking all funky as this was the only quick solution I could think of. Just finished the set up row and the first two rows of the cable chart and the hat still looks tiny. I should have swatched. But I am not frogging at this point. Worse case scenario we have a cute little model for the store. 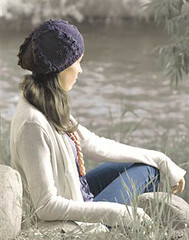 Best case scenario my friend Janine will be sitting by a pond and posing with her new hat just like this. 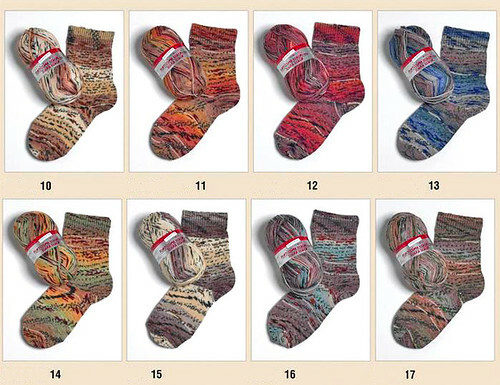 Fortissima Has a New Sock Line & We Like It! Fortissima Country Colors does the self-patterning thing just right, with beautiful colors and patterns that are not too random or too symmetrical. Country Colors comes in 100 gram skeins so one skein is enough for a pair of socks. It is machine washable and has a soft hand. I think Opal’s Rainforest has some serious competition. While I am here I might as well make a quick note to let you know that Austermann STEP came out with new colors and a set of Jacquard patterns, which it did not have before. I am sure you all know about STEP, it has jojoba and aloe worked into the fiber and makes lofty and lovely socks. I am going back to my forever-lace project, this is the 5th time I have knitted the same pattern from Knit One, Crochet Too. 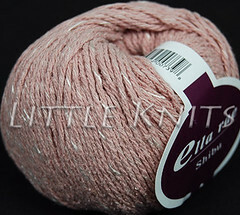 I also have to figure out what to knit with approx. 600-675 yards of light DK weight yarn that was hand painted lovingly by Pat of Fly designs. Here is a photo. It is so pretty that I could not put our name across the skein. Any ideas? 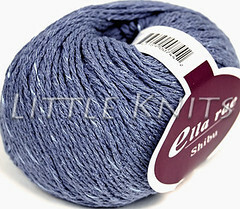 I have fallen in love with a new yarn, a rustic looking raw silk with a tiny bit of viscose (90-10% split), Ella Rae’s Shibu. 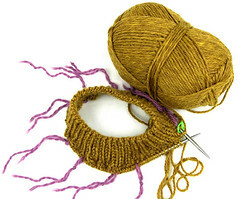 I have been trying to find the right project for this lovely yarn, a pattern that would allow me to knit up something that would show its character and depth. I wanted something very feminine yet not too frou-frou. And then I saw Tangled Yoke and thought, this is it! There was a small problem, the gauge was not quite right but I really did not want to use any other yarn, Shibu was it and I was going to make it work. This lovely raw silk was going to be my yarn for Tangled Yoke. So, I swatched, swatched and swatched, with English Rose. Shibu calls for a needle size of US 7, so I kept dropping the needle size first to 6 then to 5 and then to some odd in-between sizes. Finally, I got my gauge. My swatched looked really nice too, raw, not wooly but still substantial and very Voguesque (can I say that? ), with viscose shining through my stitches. Then I cast on, proud and happy, having made it work. I cast on 250+ stitches and knitted and knitted. Fighting the yarn, which was trying to tell me “I am not meant for this pattern.” I got into the pattern by at least 70 or so rows and I knew I was defeated. Shibu hated to be forced into a gauge that it was not meant to be and wanted a different pattern. So I admitted defeat and my folly and frogged. 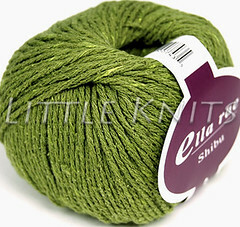 I still love Shibu and I am looking for the right pattern for this stunning yarn. 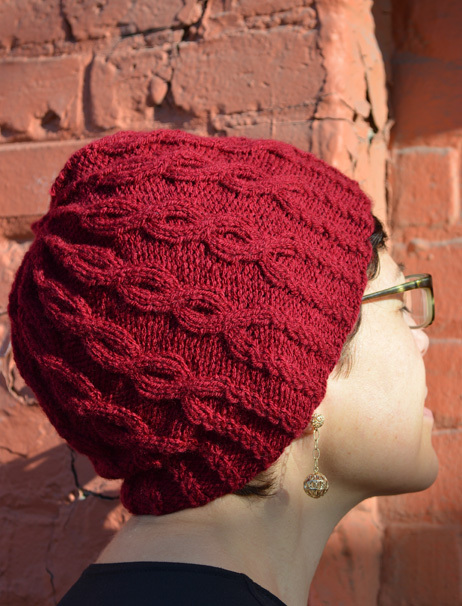 I still want to knit Tangled Yoke, a project just for me, and I am looking for the right yarn. It is a beautiful day in Seattle, crisp, sunny and smells like Fall. 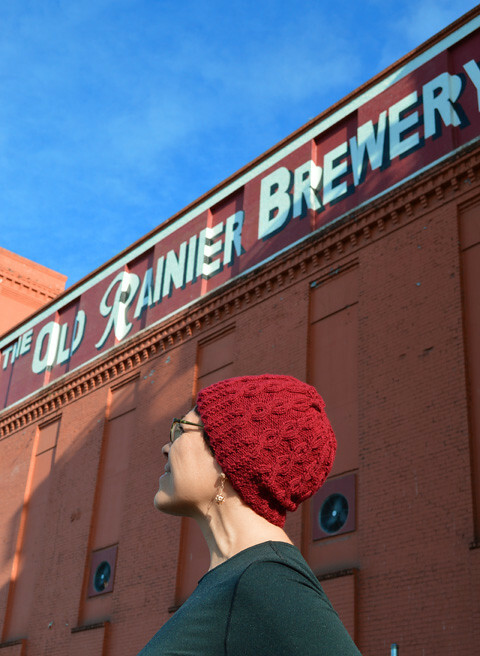 I love Fall, my favorite season of all – makes me want to knit knit knit. I think it is the perfect day for a bowl of soup and some careful stash perusal. Hope you are well and knitting with a smile.